Corruption, doping and a disregard for human rights: it seems that sporting events are increasingly overshadowed by negative headlines. In our interview, anti-corruption expert Sylvia Schenk explains why this is the case and what might be done to change it. Ms Schenk, you took part in the 1972 Munich Olympics. What feelings do you have when you look at the Olympic Games nowadays? Mixed ones. I enjoyed the 2012 Games in London, and will also enjoy some of the disciplines in Rio de Janeiro in 2016. But the pleasure is somewhat diminished by all the things that have gone wrong ahead of the Games. One factor is the political and economic situation in Brazil, and then there is the situation with the international associations. So it would probably be problematic at present no matter where the Olympics were held. I believe we are in a transition phase. London was a success, and consequently covered up the fundamental problems of the Olympic movement – partly because the London Games made a wide-ranging commitment to sustainability for the first time. Now the problems are clearly on the table. The change in tack by the International Olympic Committee (IOC) with its Olympic Agenda 2020 came very late and will still take a lot more time. Potential candidates for hosting the Olympic Games have withdrawn their applications in the recent past. What can be done to ensure acceptance of the Olympic Games by a large majority of the population? One has to embark on an entirely different course than before, and must do so credibly. I was strongly committed to Hamburg in the hope that a German application would send out a signal, both nationally and internationally, saying “this is how it can be done”. It is a shame that the population voted “no” in the referendum. That said, the scenario I had imagined had only been worked out to a rudimentary extent at the time of the vote, and had hardly been communicated at all. The subject of sustainability – and not boiled down solely to the environmental aspect but broad enough to include human rights – could have set a great deal in motion if cleverly packaged within an appealing concept. Olympic Games send out a global message, as does the Football World Cup. At the moment, the message is that ordinary people pick up the tab, that sport is corrupt, and that human rights are disregarded. Instead, the message could be that sporting events address key questions relevant to the future and help bring about social change. How active are the associations in their anti-corruption efforts? In practice there are a lot of snags. What we need to do is make long-term changes to entrenched modes of behaviour and thinking. And that takes time, as it also does in business, incidentally. Corruption always takes two. In sport, those wishing to pay bribes often come from the world of business, or for example from politics if it is a question of a host application. The media, sport, business and politics are very closely interconnected and have a wide range of conflicts of interest. It takes time to disentangle the various areas, to create transparent structures and then to generate the right awareness. Even in Germany I see how difficult it is to find people who are truly independent and can be trusted to play a governance role, dealing with individual situations not only in a consistent manner but also with the necessary tact. To ensure compliance or good governance, you need a zero tolerance attitude and people at the top to lead by good example. This applies both to the tone they use in their dealings with others and to an open culture of debate. The German Olympic Sports Confederation has laid down the principles of tolerance, integrity, responsibility and participation, yet discusses top-level sport reforms in an extremely small circle. To then present a finished result at some point in the future contradicts what it is proclaiming. How important are gender issues in this context? Women in football have noticed the opportunities that are offered by periods of reform. FIFA will have at least six women in its new council in future. Half of the board members at the Court of Arbitration for Sport (CAS) are now women. In 2014, the IOC re-emphasized the gender aspect in the Olympic Agenda 2020. Since 2012, every team at Olympic Games has had at least one or two female athletes. This is not yet enough, but it does send out an important signal, particularly to those countries in which women are hugely disadvantaged. The Qatar’s hosting of the World Cup 2022 has resulted in a women’s national football team being set up there. When inviting applications to host major sporting events, the IOC and FIFA should insist that sport be made a compulsory subject at school for girls and boys. When talking about sport, the subject of doping almost automatically arises. Is there any chance of getting doping under control? There is no such thing as doping-free sport or a crime-free society. Even in a functioning state based on the rule of law, a small percentage of criminality remains. However, systematic and systemic doping can and must be contained. The current system in place to control it is not enough. Although it serves as a deterrent, it can be avoided on an individual basis or – as we have seen in Russia – by an entire country. Wide-ranging compliance systems, checks – also of sports associations, officials and laboratories – and investigation capacities are necessary. Prevention is also essential, and not only for the athletes themselves; athletes bear the entire burden at present, with too little attention being paid to those around them. We need a fundamental change in sports culture – integrity means more than simply playing by the rules. Sylvia Schenk, born in 1952, took part in the 1972 Olympic Games in Munich as a track and field athlete. 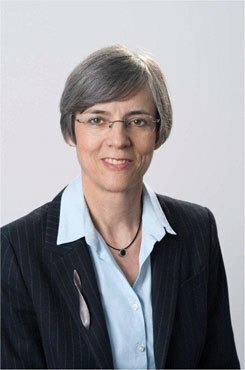 From 2001 to 2004 she was the president of the German Cycling Federation. A lawyer, she has worked since 2006 at Transparency International Germany, where she has headed the “Working Group Sport” since 2014. Sylvia Schenk has a reputation for taking tough action against doping. Christiane Moravetz conducted the interview. She was a sports editor at “Frankfurter Allgemeine Zeitung” for many years.